"This gluten-free filling can be used in a regular pie crust or a gluten-free pie crust. You can even bake it without a crust at all, like a dish of custard. A different use for the abundance of zucchini. This usually makes one pie plus about 1 cup left over, which I pour into a small baking dish and bake it like a custard." 1Bring a large pot of lightly salted water to a boil. Add the zucchini and cook uncovered until tender, about 5 minutes. Drain and cool. Process cooled zucchini in a blender until smooth; measure out 2 cups zucchini puree. 2Stir the 2 cups zucchini puree, evaporated milk, sugar, eggs, vanilla extract, cornstarch, salt, cinnamon, and nutmeg together in a bowl. 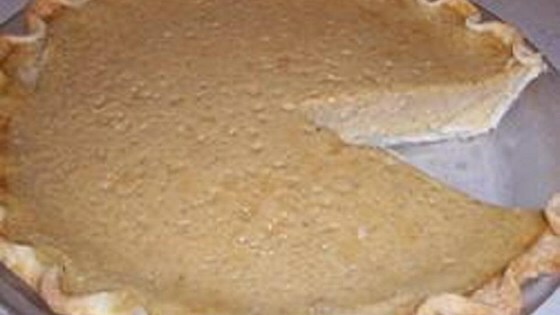 To make the pie, pour filling into a prepared pie crust and bake at 400 degrees F (200 degrees C) for 15 minutes, reduce heat to 350 degrees F (175 degrees C) and continue baking until set, about 30 minutes more.